Have I told you lately that I Love Yotam Ottolenghi’s books? I absolutely do. His recipes are something out of this world, and I think it might be in part due to genetic memory, that I’m so drawn to the Middle Eastern food. Something is so familiar and homey in the flavors:- the smell of spices, the combinations of herbs, they are like memory long forgotten that I try so hard to recreate. In my family we make a few different salads/dips with burnt eggplant. However, mint, lemon zest and pomegranate were the ingredients that intrigued me to try this recipe. And so, I present another fabulously delicious and simple Ottolenghi recipe, adapted from “Jerusalem – A Cookbook” by Yotam Ottolenghi and Sami Tamimi. However, my adaptation does not use as much olive oil as the original and added a little bit of tahini, but you don’t have to. The deep smoky flavor of the eggplant meshed with a nutty tahini is complemented perfectly by the freshness of mint and lemon with a bright pomegranate zing. Truly a marriage made in heaven. Hope you enjoy it as much as I did. Prepare the eggplant. There are three ways that you can get that burnt, smoky flavor. First:- Preheat your oven to 500 F, lightly oil a bake pan, place eggplant into the baking pan and pierce the skin in a few places. Roast until the eggplant becomes soft and the skin blisters. Second:- Grill the eggplant on the outside grill. Third – the one that works best for me, but a little messy:- If you have a gas range or cook top. Line the area around the burner with aluminum foil, because the eggplant will release a lot of juice. Place the eggplant on the grid with a medium -high flame and cook turning around until the flesh is very soft and the skin turns black and blistered. Place the eggplant in the colander with a weight on top (a plate topped with a saucepan filled with water works for me) to drain most of the liquid. After about 15 minutes of draining, peel the skin off the eggplant and chop or mash the flesh until it’s a smooth consistency. 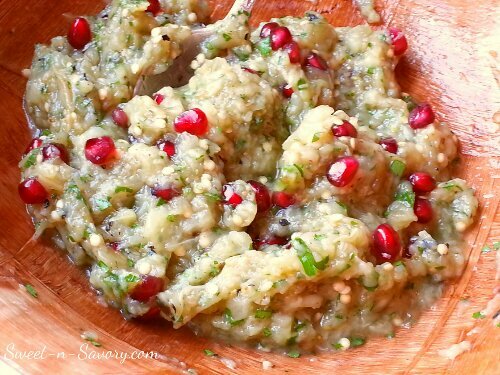 Place the eggplant into a bowl and add the garlic, lemon zest, lemon juice, oil, tahini,herbs and pomegranate seeds. Chill in the refrigerator for an hour, taste and adjust the taste with salt and/or pepper as needed. To serve, you can drizzle a little more olive oil on top. This eggplant goes great with pita chips and “Mary’s gone Crackers” sesame crackers.